Mutations in BRCA1 and BRCA2 account for approximately 50% of breast cancer families with more than four affected cases, whereas exonic mutations in p53, PTEN, CHK2 and ATM may account for a very small proportion. It was recently reported that an intronic variant of p53 - G13964C - occurred in three out of 42 (7.1%) 'hereditary' breast cancer patients, but not in any of 171 'sporadic' breast cancer control individuals (P = 0.0003). If this relatively frequent occurrence of G13964C in familial breast cancer and absence in control individuals were confirmed, then this would suggest that the G13964C variant plays a role in breast cancer susceptibility. We genotyped 71 familial breast cancer patients and 143 control individuals for the G13964C variant using polymerase chain reaction (PCR)-restriction fragment length polymorphism (RFLP) analysis. Three (4.2%; 95% confidence interval [CI] 0–8.9%) G13964C heterozygotes were identified. The variant was also identified in 5 out of 143 (3.5%; 95% CI 0.6–6.4%) control individuals without breast cancer or a family history of breast cancer, however, which is no different to the proportion found in familial cases (P = 0.9). The present study would have had 80% power to detect an odds ratio of 4.4, and we therefore conclude that the G13946C polymorphism is not a 'high-risk' mutation for familial breast cancer. Mutations in BRCA1 and BRCA2 account for approximately 50% of breast/ovarian cancer pedigrees with more than four affected cases , whereas mutations in PTEN , CHK2  and ATM  have been reported in a small number of breast cancer families or women with early onset breast cancer. In addition, germ line missense mutations in the p53 gene are associated with Li Fraumeni syndrome, a feature of which is early onset breast cancer . The p53 gene is the most commonly mutated gene in human malignancies and has many important biological functions, including the control of cell cycle checkpoint after DNA damage. Deleterious germ line mutations in the p53 gene are found in less than 1% of all breast cancer patients, suggesting that the contribution of exonic mutations to familial breast cancer risk is small [6,7,8,9,10]. However, mutations in regulatory regions of the gene may affect p53 expression and thereby increase the risk of disease. One candidate for such a mutation is the G13964C variant in intron 6 of the p53 gene, which has been reported in 3 out of 42 patients with hereditary breast cancer (including a CC homozygote affected at age 59 years) but in none of 171 sporadic breast cancer patients (P = 0.0003) . All three patients with the p53 variant had strong family histories that were consistent with Li Fraumeni syndrome but had a late age at onset. Intronic variants may affect gene regulation through aberrant splicing or through disruption of critical DNA–protein interactions . The p53 G13964C variant is not within the consensus splice site and there is thus far no direct evidence that it affects the expression of p53. It is not associated with over-expression of p53 , which is a hallmark of missense mutations in p53. Nonetheless, there is some indirect evidence that this variant has a functional role . Functional analysis using an in vitro cell survival assay demonstrated that lymphophoblastoid cell lines derived from patients with the G13964C variant exhibited a reduced level of apoptosis after chemotherapy and prolonged cell survival following DNA damage. In order to determine the importance of the G13964C p53 variant in multiple-case Australian breast cancer families, we genotyped this variant in the youngest affected member of 71 breast cancer families and 143 control individuals. Our results suggest that the rare 13964C allele is no more common in breast cancer families than in control individuals. This suggests that the variant is not a high-risk mutation but, as suggested previously , is more likely to be a benign polymorphism. Breast cancer cases were the youngest affected members of multiple case families (n = 71), ascertained through Family Cancer Clinics by the Kathleen Cuningham Foundation Consortium for Research into Familial Breast Cancer . The Consortium entrance criteria for families without known mutations in BRCA1 or BRCA2 are four or more cases of breast or ovarian cancer (or two or more if one has 'high-risk' features, such as diagnosis at less than 40 years) in the same or adjacent generations. All of the families were tested by diagnostic laboratories for mutations in BRCA1 and BRCA2 by a variety of tests (including heteroduplex analysis, single strand conformation polymorphism, protein truncating test, chemical cleavage of mismatch, allele specific oligonucleotide hybridization and direct sequencing). It is estimated that most laboratories would have detected approximately 80% of BRCA1 and BRCA2 mutations (excluding the large deletions) by their chosen methods. Two separate control samples were included in this study. The first group included individuals (n = 95) without breast or ovarian cancer who were selected from the Australian Breast Cancer Family Study (ABCFS), a population-based case–control family study of breast cancer in women recruited in Melbourne and Sydney from 1996 to 2000 . These control women were aged 40–60 years (mean 49.7 years, SD 5.4 years) at interview, and had no first-degree or second-degree relatives with breast cancer. The second group comprised unrelated adult female monozygotic twins (n = 48) who were selected from a sample of 3348 twins of almost exclusively European descent, recruited through the volunteer Australian Twin Registry for the Semi Structured Assessment for the Genetics of Alcoholism research study . Age at interview ranged from 30 to 75 years (mean 46.6 years, SD 11.9 years). A PCR-RFLP assay was used to detect the p53 intron 6 G13964C variant. A 131-bp PCR product was amplified using 10 pmol of each primer (5'-GCCTCCCCT-GCTTGCC-3' forward primer and 5'-CCGCCCATGCAGGAACT-3' reverse primer) in a 10 μl reaction mix containing 20 ng genomic DNA, 200 nmol/l dNTPs, 1 × Perkin Elmer PCR buffer II, 1 U Taq polymerase and 1.5 mmol/l MgCl2. Cycling conditions were 94°C for 4 min; followed by four cycles of 94°C for 20 s, 60°C for 20 s and 72°C for 20 s; and 30 cycles of 94°C for 20 s, 58°C for 20 s, and 72°C for 20 s, with a final extension of 72°C for 7 min. 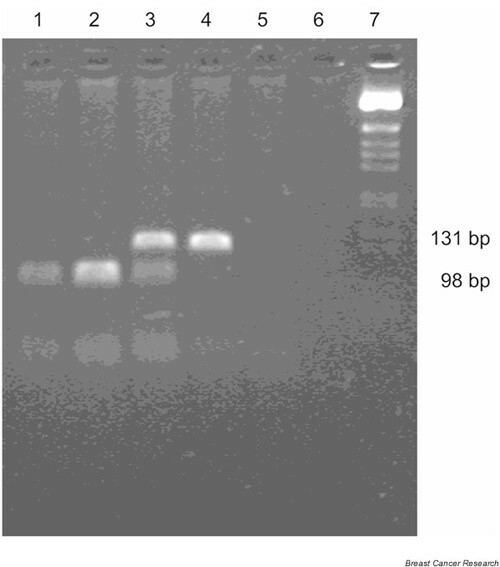 Of the 131-bp amplified product, 3 μl was digested with 4 U of HhaI restriction enzyme (New England Biolabs) in a 12 μl reaction with 1 × NEB Buffer 4 and 1 × bovine serum albumin (New England Biolabs, Beverley, MA, USA) at 37°C for 1–2 h. The digested products were separated on a 4% NuSieve agarose gel (Bio Whittacker Molecular Applications, Rockland, ME, USA) and the genotype determined by the banding pattern observed. Reaction products were sized relative to a BRL 1-kb ladder (GIBCO BRL, Catalogue number 15615-016; Life Technologies, Rockville, MD, USA). The GG genotype is indicated by the presence of 33- and 98-bp fragments; GC by 33-, 98- and 131-bp fragments; and the CC genotype, which lacks a HhaI restriction site, by a single 131-bp product (Fig. 1). GC heterozygotes identified by the restriction endonuclease assay were amplified and sequenced using the primers described above and the ABI Prism BigDye Terminator Cycle Sequencing Kit (Perkin Elmer) for automated sequencing. Detection of the G13964C variant by PCR-RFLP assay. The C→G nucleotide substitution creates a HhaI site, and the G allele is detected by HhaI digestion of the 131-bp product to 98-bp and 33-bp products (the 33-bp product is not adequately resolved on this gel). Lanes 1 and 2, GG; lane 3, CG; lane 4, CC; lanes 5 and 6, no template control; and lane 7, BRL 1-kb ladder size marker. Screening with the PCR-RFLP assay identified the p53 intron 6 variant in 3 out of 71 (4.2%) heterozygote familial breast cancer patients (diagnosed at the ages of 42, 43 and 48 years). None of these patients had family histories indicative of Li Fraumeni syndrome, although their families did include patients with cancer of the bone, pancreas, cervix, stomach and prostate, as well as chronic lymphocytic leukaemia and non-Hodgkin's lymphoma. We also genotyped 143 control individuals without breast or ovarian cancer. The rare allele was detected in 3 out of 95 (3.16%) ABCFS control individuals and in 2 out of 48 (4.17%) twin control individuals, resulting in a frequency in pooled control women of 3.5%. This is not significantly different from the frequency in the familial breast cancer cases (P = 0.9; Fisher's exact test). The ABCFS control individuals who were heterozygous for the G13964C variant were aged 42–48 years at time of interview. None of those women had a personal history of cancer, but two had a family history of brain (age of onset 72 years), lung or gastrointestinal cancer. The two heterozygous twin control individuals, who did not have a personal or family history of cancer, were aged 21 and 62 years. Direct sequencing of seven heterozygote individuals confirmed that the variation detected by the HhaI restriction endonuclease assay was due to a G→C nucleotide substitution at position 13964. The G13964C intronic variant was detected in eight individuals in total, none of whom had a family history of Li Fraumeni syndrome. Because the G13964C intronic variant was identified in individuals aged from 21 to 62 years with no evidence of cancer at the time of recruitment and with no reported family history of breast cancer, the present results suggest that this variant is not associated with an increased risk for breast cancer. These findings contradict the results found by Lehman et al , who did not observe the variant in 171 sporadic breast cancer control individuals and reported a significantly elevated frequency in familial breast cancer. The present study would have had 80% power to detect an odds ratio of 4.4, and therefore we can conclude that the G13964C is not a high-risk mutation for breast cancer. Instead, our results support the proposal that the G13964C site is a benign polymorphism, as originally suggested by Buller et al . The variant lies within the noncoding region of the gene and is not associated with over-expression of p53 . In conclusion, although Lehman et al  reported that the p53 G13964C variant acts to hinder chemotherapy-induced apoptosis and extend cell survival following DNA damage, these functional differences may not play a significant role in the aetiology of breast cancer. Our data do not provide any insights into the function of the G13964C polymorphism at a cellular level, but they do indicate that it is not significantly associated with familial breast cancer in Australia. The authors would thank Xiaoqing Chen for technical assistance; Kate Minkoff, Susanna Nicosia and Toula McCardle for data cleaning; Nick G Martin for the twin control DNAs; and the breast cancer families and control women for their participation. This work was funded by the National Health and Medical Research Council of Australia and the National Breast Cancer Foundation.